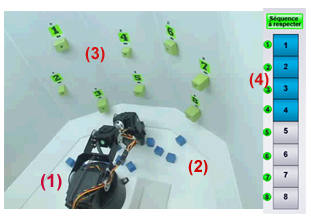 Use the robot (1) to pick up the blue cubes (2) and to place them on the selected shelves (3) in a predefined order as shown on the right (4). try to place as many cubes as possible within the time limit. The monthly score is based on your best daily game between midnight and 23h59 normal eastern std time(UTC-5). - The first level ("Block") goal is to take a block with the robot's claw and to lift it of the ground. 10 points will be awarded. - The following levels consists of putting a bloc on the right shelve (in the order of the sequence of play of the day). The block must remain in place following the withdrawal of the claw of the robot. 10 points will be awarded for each block putted on the right shelf. *** By reaching at least the "Bloc" level once per day, you'll accumulate a minimum of 300 points per month !